Day 1 of D23’s Convention last August was off the charts exciting. On Day 2 we went to the Let the Adventures Begin: Live Action at The Walt Disney Studios Panel. We got to see previews of the film Maleficent! When the final logo came up on screen, the auditorium roared with excitement. Low and behold, Angelina Jolie was introduced and talked about making the film. They showed the following clip and we were all instantly excited. This scene is the pinnacle point and overall gem of the film. Do not miss this part when you go see it. Disney has been modernizing their classic fairy tales. Traditional hero and villain roles have been getting turned upside down. 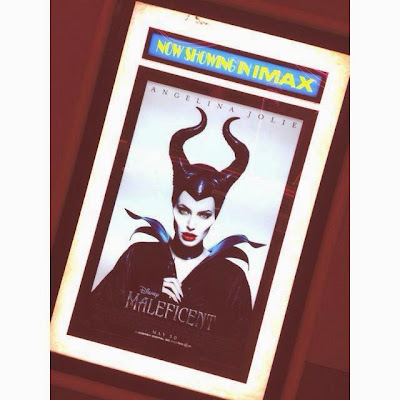 Maleficent is still the strong, powerful woman we all love to hate...but maybe just a little less. Slowly the film peels away the layers of her persona that we might not know from the classic animated feature Sleeping Beauty. The film begins by introducing Maleficent as a young fairy who befriends a human boy named Stefan. Stefan moves on from Maleficent's friendship and seeks great power. She becomes the most powerful fairy in the Kingdom of Moor. In a power play to ascend to the throne, Stefan betrays Maleficent. Maleficent cinematography is beautiful. The camera lays out a gorgeous view of fanciful kingdoms. As Maleficent grows older and darker so does the cinematography and the costuming. The film serves as a reminder that not everything can be fixed with true love’s kiss. FYI: Maleficent just grossed $70M at the box office opening weekend.